I took a bit of a hiatus from my blogs to get some personal stuff sorted and catch up on school work. That left no time for reading, because how can I blog about books if I have not read any? I am back and I have stuff to share! I recently attended Salt Lake Comic Con and while yes it is a comic convention we were more interested about is books! I was able to get signatures from a couple of different authors. 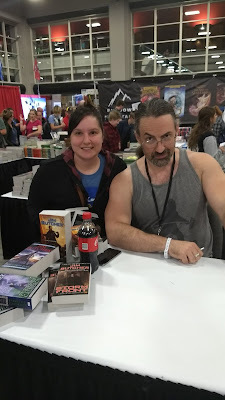 What I really was excited about was I got to meet Jim Butcher. I've reviewed a couple of his books on the blog and I've liked them all. I only attended 1 panel as we spent more of our time (and money) walking the floor. I'll have a separate post on my convention haul. It was so much fun, can't wait for next year.